Today I spoke about Bristol and the Playable City at the Cities & Design conference, part of World Design Day organised by Bilbao-Bizkaia Design & Creativity Council. 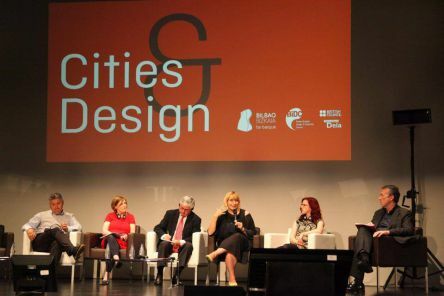 It was a fantastic event and I have thoroughly enjoyed finding out more about how Bilbao is a city characterised by intelligent debate, commitment to quality and development driven by design as an instrument of social change. I also really appreciated the opportunity to connect with my compatriots from other British cities. It seems that sometimes we have to remove ourselves entirely from the UK to really get to know one another. Below is an abridged version of my presentation for those of you unable to join us in person. Bristol is a small city of a similar size to Bilbao, with 300,000 in central Bristol and some 1 million people in the wider city. 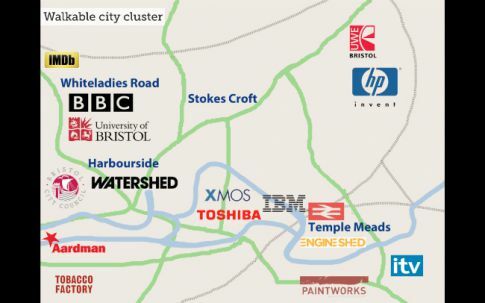 Also like Bilbao, Bristol is an inherently walkable city cluster. 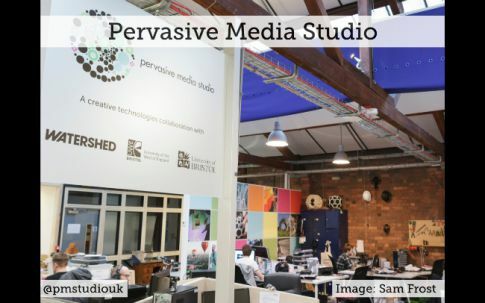 We are lucky to be small enough to easily connect with the fantastic large and small players in the creative, technology and knowledge sectors based in the city. We readily collaborate together, have a drink together, argue together and swap ideas. 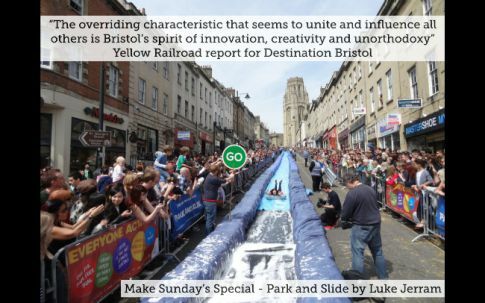 Bristol in renowned for its spirit of innovation, creativity and unorthodoxy. This is characterised by a new initiative called Make Sunday Special that our elected mayor refers to, not as closing our streets to cars, but by opening them to the people. The city centre is transformed into a place for markets, performance, music, games and sometimes giant water slides. Bristol is proud of having a strong culture of environmentalism, it is a big cycling city and embraces green design and architectural practices. 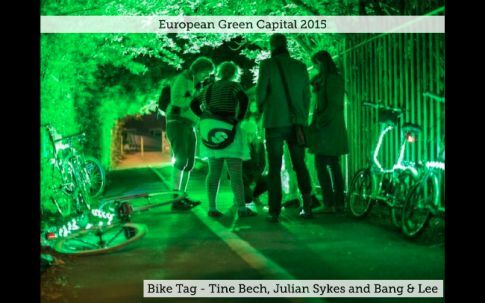 Next year we will become the European Green Capital and we look forward to working together to further this citywide agenda. It is a city where the creative industries and the silicon, hi-tech and aerospace clusters rub alongside one another and regularly come together to share ideas and to experiment. 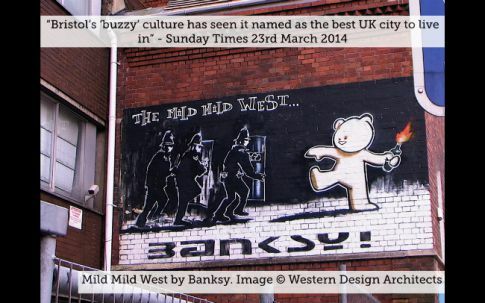 Bristol has become famous for it’s street art, with Banksy spearheading an international shift in how city authorities and citizens value graffiti in public space. It has a strong musical identity too with bands such as Massive Attack and Portishead breaking through in the 90s and more recently with pioneering drum and base and dubstep scenes. It is also the home of a growing movement of street games led by Slingshot and with companies like Splash & Ripple, Daredevil Project and Anagram blurring the edges between theatre, games, cinema and play. Slingshot’s headline zombie chase game 2.8 hours later tours internationally and has now been played by over 50,000 people as they run through familiar but transformed city spaces, pursued by zombies hungry for their brains. One of the key hubs for this type of movement is Watershed where I work. It is a cross-artform venue and producer, sharing, developing and showcasing exemplary cultural ideas and talent. We are based in Bristol, but place no boundaries on our desire to connect with artists and audiences in the wider world. We curate ideas, spaces and talent to enable artistic visions and creative collaborations to flourish. We produce work that cuts across film, music, theatre, design, visual art, and the creative and technology sectors. 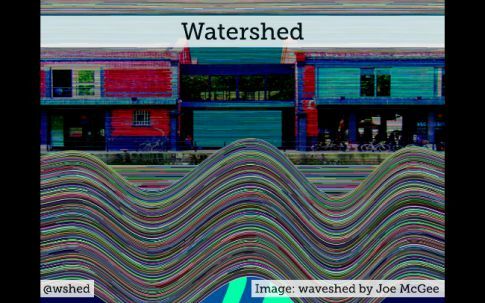 Within the Watershed is the Pervasive Media Studio, a brilliant community of over 100 creative practitioners, startup companies, technologists and academics exploring experience design and creative technology. It is a collaboration with University of West of England and University of Bristol, managed by Watershed. Our projects include gaming, projections, music, connected objects, location-based media, robotics, digital displays and new forms of performance. Some are commercial, some are cultural. We test our projects as early as possible and iterate. So what might we do differently? 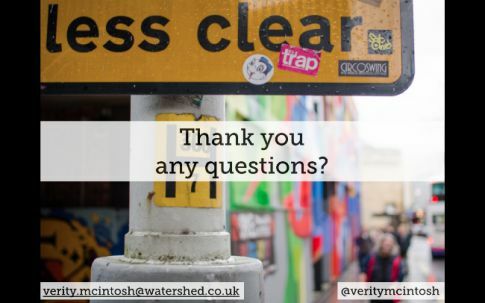 We have talked a bit about what makes Bristol distinctive but in the last few years we have observed something of a global movement emerging in numerous cities that we felt needed further exploration. From Luke Jerram’s Play Me I’m Yours street pianos, to Syndey’s breakfast on the bridge, Utrecht’s Transfer Accelerator and Fun Theory’s fantastic Piano Staircase, people and places around the world are making playful interventions that make their cities more malleable, more permissive. 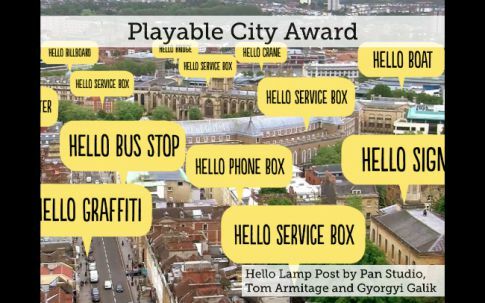 In response to this, we devised the Playable City Award, an international arts and technology prize, inviting practitioners from all disciplines to pitch us their big idea about what might make a city playable. 100 applications from 25 countries and we commissioned Pan Studio, Tom Armitage and Gyorgyi Galik to create Hello Lamp Post. Hello Lamp Post was installed in Bristol for eight weeks during the summer of 2013. We were astonished by how voraciously people chose to play and we received over 25,000 player messages and huge media interest from around the world. The project is currently installed in London’s Design Museum as one of their Designs of the Year 2014. We have just announced the winners of the Playable City Award 2014, designers Jonathan Chomko and Matthew Rosier for their project ‘Shadowing‘. 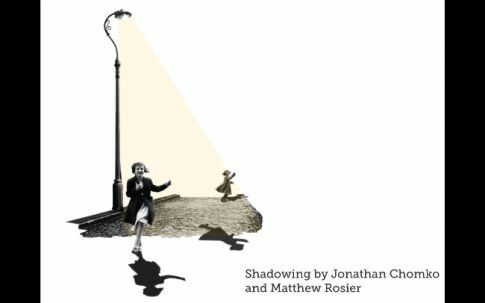 From September this year, Shadowing will give memory to Bristol’s city lights, enabling them to record and play back the shadows of those who pass underneath. We are very much enjoying working with Jonathan and Matthew on the interaction design for this installation to explore the affect that it might have in public space. Will it feel delighting or sinister? Can it be a little of both? 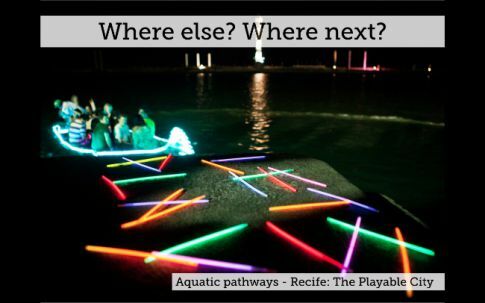 We recently worked with partners from Recife in Pernambuco, Brazil to bring together Brazilian and UK-based artists, producers and technologist to think about and make Playable City interventions designed for a specific context in Brazil. It was fantastic to work with members of a city who offered a unique perspective on how the Playable City idea might be applied more as a tool to address social challenges. 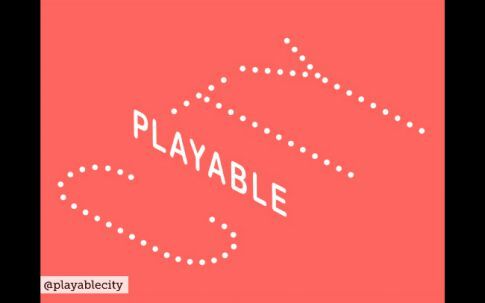 We know from a number of vitalising conversations, workshops and visits that the Playable City narrative has a resonance with citizens around the world and can inspire responses and approaches as idiosyncratic as the places and people who propose them. We are now working towards a global network of Playable Cities. We would love to hear from you your thoughts about what Bilbao’s response to this notion of Playable Cities might be. 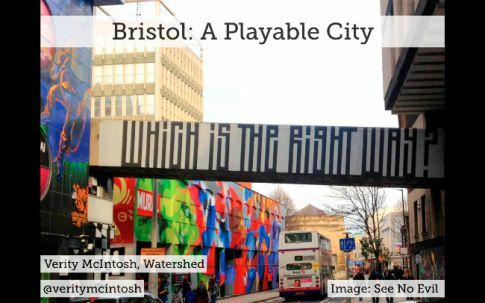 If you would like to find out more, discuss Playable Cities with some of the leading voices and pratitioners in this global movement, and attend the launch of the Playable City Award winning ‘Shadowing’, join us in Bristol on 10 & 11 September for the Making the City Playable conference.